The launch of the warm and witty new Daughters of Swallow’s Fall series, from the author of the internationally bestselling The House on Burra Burra Lane. Actress Edie Granger is in a spot of trouble. When a big-time producer threatens to ruin her career—and possibly the rest of her life—she flees to her remote hometown in the Snowy Mountains and opens a Little Theatre to put on her comedy whodunnit Who Shot the Producer. Childhood friend and ex-Commando Ryan Munroe has returned to Swallow’s Fall to see if there’s a future for him and Edie after their disastrous but unforgettable first and only kiss three years ago. She’s still dazzling, still in love with her career and still out of his reach. He’s about to leave town when he learns that Edie might have trouble on her heels. Struggling with her growing attraction to Ryan, and torn between her career and a rekindled love for her hometown, Edie focuses on generating her cast and crew from the 182 Swallow’s Fall residents, and producing her play. But when elements from the play start happening for real, the comedy turns dangerous. Edie is suddenly centre stage in the biggest role of her life. Can she pull it off? And can Ryan ensure everyone survives to make it to the curtain call? I am a fan of the Swallow's Fall series by Ms Jones, so the chance to read the spin off series was a no brainer for me. We are back in Swallow's Fall with Edie Granger and Ryan Munroe. After a failed relationship attempt a few years ago, they went their separate ways. Now they are back in their home town and things can only be better than their parting, right? I adore Ryan. He is all kinds of beautiful and swoony and any woman would give her left one to have him. Heck, I will take him off Edie's hands if she doesn't want him! Now, Edie on the other hand, she frustrated me no end. I wanted to love her, I really did, but she was so wishy washy to me. Not professionally, I think she was amazing at what she does, but personality wise, nope. I can't tell you how many times I talked to Ryan as I was reading, telling him to run run away, as fast as he could. The way she kept leading Ryan on then backing away - gah! Make up your mind woman. But this might just be me. 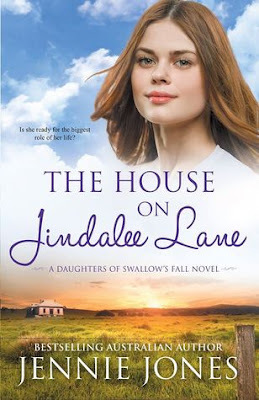 I loved getting back to Swallow's Fall, catching up with characters that have come to feel like friends in the previous series, and even though The House On Jindalee Lane fell a little short for me, I will definitely be reading the other books in the series as they are released.